Director George Lucas was finishing up the original Star Wars movie, but it was proving to be no easy task. In order to bring those now-legendary worlds to life, he needed to reach beyond the technology that existed. He needed cutting-edge special effects, camera tricks, creatures, and models. So he did what any visionary does when there’s a problem to be solved—he created the solution and in turn created an entire company to accomplish what he needed: Industrial Light & Magic (or ILM). Star Wars went on to become the highest grossing movie in history at the time of its release. Moviegoers had simply never seen anything like it. As the Star Wars legacy grew, so did ILM’s body of work: with their state-of-the-art facilities and world-class team of artists, technicians, and (most importantly) dreamers, they became highly sought after to bring unbelievable and revolutionary visions to the big screen. They blazed new ground by creating the first characters animated with computer generated imagery (CGI) and blended it with footage shot with real actors. To date, they have won 15 Academy Awards and worked on some of the highest-grossing films in history, like E.T. the Extra-Terrestrial, Indiana Jones, Pirates of the Caribbean, Marvel’s The Avengers, Men in Black and the Transformers series. And in December 2015, after 10 long years, we got to see their latest chapter in the Star Wars saga, Star Wars: The Force Awakens! Millennium Falcon out running TIE Fighters on the desert planet Jakku. Those visuals have gone a long way in setting the Star Wars universe apart from all other sci-fi stories. Some people spend hours cleaning; Lobl and his digital team spent months making things look dirty! “Everything in the Star Wars universe is lived-in and used,” Lobl explains. “So after we build it, we dirty it up to make it look like it was built in a workshop instead of a computer. There are times we end up putting layers of grime into rivets, creases, and folds to make something feel used. There’s a very long history to things that have been around in these films.” Each of those “layers of grime” are details created in, and applied by, ILM artists to make each fabricated item in the film look like they have their own story to tell. Part of Star Wars: The Force Awakens’ excitement behind the scenes at ILM came from a focus on practical effects (things done on set, filmed in front of the camera) then mixed with CG elements. 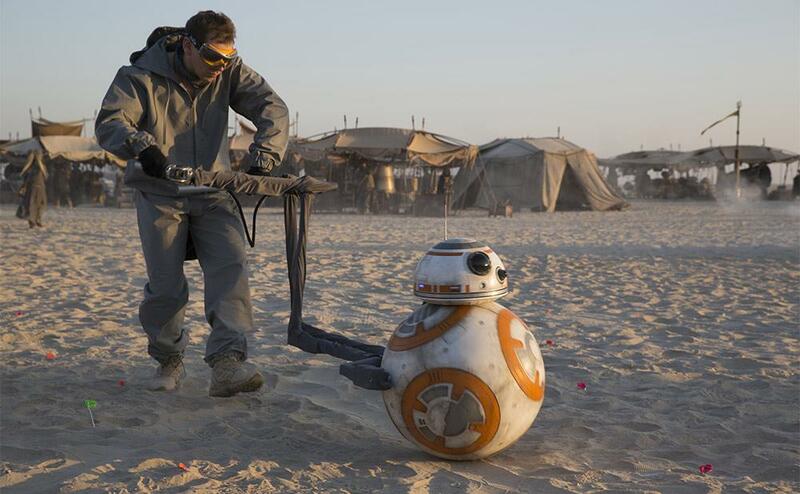 No practical effect took on a life of its own — literally — more than BB-8, the new droid who became a breakout character. “A lot of times we would have an actual BB-8 in the shot, a puppet or an animatronic,” Lobl explains, “and it raised the bar super high! 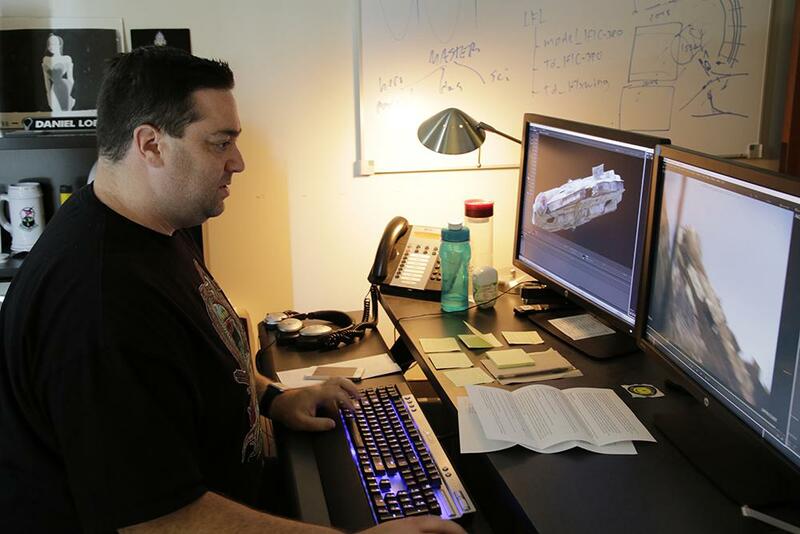 Instead of working from a blank slate, everything had to look as good as the real thing that was filmed.” The puppeteers behind BB-8 “deserve all the credit for coming up with his mannerisms and we worked diligently to duplicate them in the computer,” Lobl continues. “When they’re running through the Jakku desert from the TIE Fighters, most people look at Rey or Finn… but watch BB-8, and he looks so worried, looking back at the explosion and trying to keep up with these running humans! You feel the apprehension in his performance and it’s digital in that shot.” Lobl and the digital team enhanced the little droid’s “acting” with a fun feature: “It also has all these lights all over him. We tried to come up with different lighting patterns, different sequences, and you can kind of get through different emotions depending on the speed or pulse rates in the lights.” Talk about light and magic, right? 2,100 Shots, But Who’s Counting? Now that Star Wars: The Force Awakens has successfully brought the old and new together to delight audiences throughout the universe, it’s time to look forward to the future. 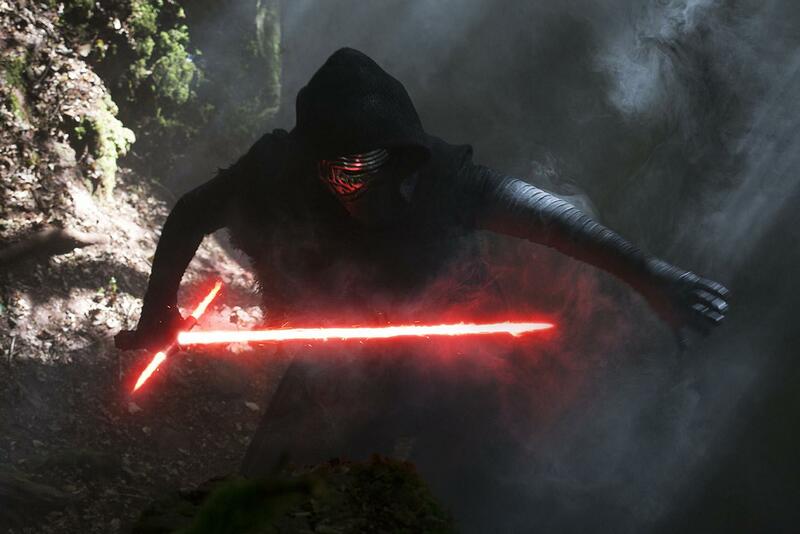 Will Lobl be working on Episode VIII, coming out in 2017? “I hope so!” Lobl says with a laugh. So do we… with talented fans like him behind the scenes, this universe is in skilled hands! Want to bring your own BB-8, Kylo lightsaber, or other The Force Awakens icons to your home planet? Head to DisneyStore.com, and keep your Disney Visa® Card close for 10% off select merchandise purchases of $50 or more or redeem Disney Dream Reward Dollars® at Disney Store and DisneyStore.com toward any gear, games, and more!1,2 Additionally, Star Wars: The Force Awakens has landed on Blu-Ray, DVD and Digital HD. 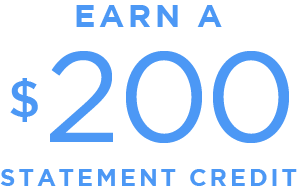 Cardmembers can redeem their Disney Dream Reward Dollars® toward the film that brought the Star Wars saga to a new chapter and a new generation! Exciting announcement: Rolling straight from the desert of Jakku to your pocket, the BB-8 Disney Visa card art is now available!3 Explore a galaxy of rewards and perks with everyone’s favorite new droid by your side. See a preview below!